Here’s our round of up this weekend’s gig picks. There’s some great gigs on, the weather’s going to be fantastic, it’s just past payday so there’s no excuse for not getting out there and seeing some live music. 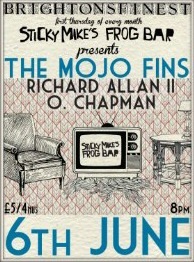 On Thursday night, The Mojo Fins headline Sticky Mike’s Frog Bar. There’s some great support slots too – Curxes are supporting Chapel Club at The Haunt, and Negative Pegasus are supporting Holland at Green Door Store. Friday night see’s Time for T playing at St Luke’s Church on Old Shoreham Road. This is one of the first gigs we’ve heard of taking place at St Lukes, so could be interesting. Ourother Friday Night gig pick is also in a church – Abi Wade is supporting Olof Arnalds in the Unitarian Church. At the Brunswick on Saturday Night House of Hats host this month’s Harvest Sessions, with support from Emily Baker and Cordelia Gartside. If you fancy an all dayer on saturday then head over to the Green Door Store for Cupboard Music’s second annual Hey! Fever gig. There’s ten bands on over the course of the day, with Negative Pegasus and Black Black Hills topping the bill.